There are different types of online businesses that you can do and for each one there are different ways of receiving your money. Some online businesses are run by big foreign companies and they are the ones that pay you while some of the other businesses can be setup and run entirely by you without having to register with a foreign company before you can get paid. Another way you may get paid in those businesses where you have to register with foreign companies, is that your payment could be wired directly to your domiciliary account and you can cash it out in dollars or naira after few days. In some other foreign programs, what they do is to periodically send your payments to you in the form of a foreign cheque. This cheque will be sent to your address in Nigeria by post and when you receive it, you can take it to the bank and cash the money using a domiciliary account. Payments received via this method may take several months to finally hit your bank account. Tip: A domiciliary account is a type of bank account offered by many banks in Nigeria. 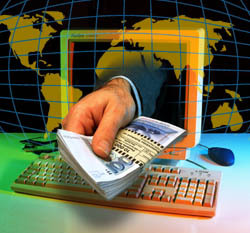 Note that you do not need to wait until you have a domiciliary bank account before you start learning online business. Most times you won’t need it until after a few months. A second method that you can use to get paid is through an online payment processor or what is commonly known as a merchant service. Not all such services work well in Nigeria but there is an indigenous Nigerian company that allows you to collect money from customers online through Interswitch Verve ATM cards and other local credit/debit cards like Visa and Mastercard and then deposit this money into an online account which you can easily withdraw to your real Nigerian bank account within days. For the other types of businesses that you can open and run on your own, payments are made by clients and customers directly into your bank account with any Nigerian bank. This can be a normal savings account, current account or company/corporate account. Payments received via this method get to you instantly because the people paying you will deposit the money directly into your account and you can withdraw immediately. It involves you advertising or marketing something to your website visitors and asking them to pay into your account to receive the service or product. You receive money anytime someone buys your stuff or pays you for some service. The most lucrative example of this sort of business is information marketing where you sell digital goods like e-books, reports, videos etc. ‹ Q n A: How Soon Will I Start Making Money if I enter Online Business?